Effective workload automation that provides complete management level visibility into real-time events impacting the delivery of IT services is needed by the data center more than ever before. The traditional job scheduling approach, with an uncoordinated set of tools that often requires reactive manual intervention to minimize service disruptions, is failing more than ever due to todays complex world of IT with its multiple platforms, applications and virtualized resources. 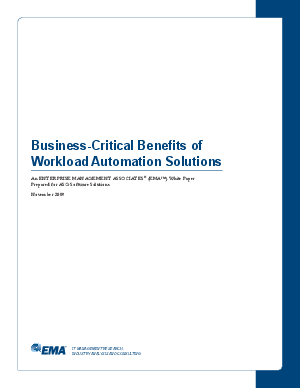 Read this new White Paper from Enterprise Management Associates to learn about the benefits of workload automation and how it can give IT decision makers enterprise-wide insight to ensure the successful delivery of business services.